Pirate (unlicensed) radio stations did exist in the Twin Cities. Some of these DJ operators went on to real jobs in radio. Scroll down to listen to numerous airchecks. This Site Primarily Contains a Collection of Airchecks of Numerous Twin Cities (Minneapolis/St. Paul) Radio Stations, Some Recorded Off The Air by Rick Burnett and Many Others Recorded or Provided by Other Contributors to This Site (see footnote at bottom). The Contribution of Recordings and Materials are Greatly Appreciated and Have Made this Site a Bookmark for Those Interested in Radio From this Era. Explore the many recordings on this site by using the menu at the left side of the screen. This page of the site has photos and recording of Twin Cities (Minneapolis St. Paul) pirate radio station history. Remember that these are recordings of high school and teenager pirate radio stations and the level of professionalism is at that level with some exceptions. Some of the people who started in pirate radio went on to jobs in real radio and some of these individuals were exceptional. Certainly well known KQRS Operations Manager, Dave Hamilton, is one of these. 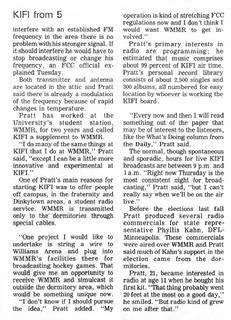 Another exception that is not well known in the Twin Cities is Bobby Kraig, who grew up in Minneapolis and attended Brown Institute, got his first on the air radio experience at at WXYE-FM in St. Paul in 1970. Bobby later went on to be named Billboard major market Country Music Program Director of the year for 3 different years. He became Program Director of KPLX (Dallas, TX) and held that position until 1993. During that time he was awarded Program Director of The Year by Billboard Magazine in 1987, 1989, 1990 and 1991. In 1990, he received the same award from the Country Music Association. Bobby was inducted into the Country Music Radio Hall of Fame in March 2008. He applied at WDGY in the early 80's when it was Country. Although he did not get that position, he did well in Dallas. I worked with Bobby at two stations; WHSM in Hayward Wisconsin and at WWCM in Suburban Terre Haute Indiana in the early 70's before Bobby went on to the big time in Dallas Texas. Bobby help to get me my jobs at both stations. I am proud to have worked with Bobby Kraig in both Pirate and commercial radio. 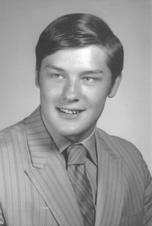 Bobby Kraig grew up in Minneapolis and attended Brown i 1972. He got his first on air experience at WXYE-FM, the 70's pirate station in St. Paul. He eventually worked in Dallas and received numerous Program Director of the Year Awards from Billboard. He was named to the Country Radio Broadcasters Hall of Fame. In 1977, he became morning air personality and Program Director at WONE (Dayton, OH). He later became Program Director of KPLX (Dallas, TX) and held that position until 1993. Paul Yanchek, friend, former radio announcer and engineer in Grand Rapids, MN, and former operator of the non-licensed FM pirate station in St. Paul, WXYE, died January 7, 2007. Paul was 56 years old at the time of his death. 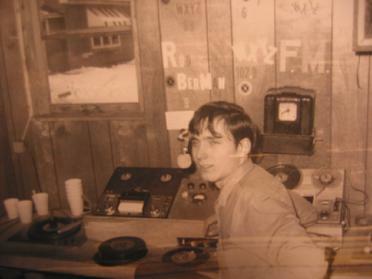 He and his friends shared a love of radio as they were growing up and they participated in the operation of a pirate FM station in Paul's family garage. Paul's electronic knowledge allow us to get the transmitter out farther with great quality electronics. Unfortunately, Paul's electronic talent could not help us with our voices and talent. We had a lot of fun at the pirate station and a place to operate thanks to Paul and his family. This pirate station was the first on-air experience for Bobby Kraig, who was nominated for the Country Music Radio Hall of Fame and inducted in March 2008. Although the rest of us ended up in commercial radio, we did not stay in, nor were we as successful of Bobby. However, we all have Paul to thank for helping us get into commercial radio. This page is for my commercial and pirate radio friends. This page will appeal to those interested in hearing old radio airchecks of commercial Twin Cities radio stations as well as rare airchecks (below) of some Twin Cities pirate radio stations. I have more, in addition to the clips below, to be added as I get time to get them out of storage - check back. In the late 60's and early 70's there were a few Pirate (non-licensed) FM stations in the Minneapolis/St. Paul area. 1. KACS-FM 106.1 Mhz, Edina, MN. 2. WXYE-FM 105.9 Mhz, St. Paul, MN. KACS-FM in Edina was located on Sherwood about a block away from the old Edina High School just off Highway 100. WXYE-FM, the Big 106, in St. Paul was located Randolph Street and West 7th Street. KACS-FM had better sounding DJ's and got out a couple of miles. WXYE-FM had better equipment and was able to get out a little further using a Radio Shack Wireless Mic (a P-Box Kit Radio Shack sold in the 60's) that was modified. Both of these stations maintained regular night-time and weekend hours. They played top 40, had jingles, and played commercials like the licensed stations (but not for money). The stations even received free promo copies of new music from the local record distributors, such as the Heilicher Bros, who also owned Musicland at the time and represented major labels. Naturally, record labels apprciated any free play of the music to promote sales. The one thing that stood out was some of the higher pitched voices. There was also a Pirate station in South Minneapolis using the call letters of KSMR, operated by Jeff B. the son of a well know jewelry store owner, and another in Minnetonka using the call letters of WSKC (this operator, Dave Hamilton, ended up at KDWB as Dave Cooper and currently in management, responsible for KQRS and other stations). Some of the other DJ's went on to work in commercial radio later on. While the stations were operating, most of the DJ were high-school aged. Both KMSR and WSKC were playing a progressive format, while WXYE and KACS were playing a Top 40 format. I am trying to find some more pirate radio airchecks, so check back soon. I met Al Arneson in 1969. I was 3 years older than Al and he graduated from Edina High School in 1973. He was previously associated with another pirate radio station in Edina (a Southern Minneapolis suburb operated by Kim Cummings, who later worked at WMIN-AM when it was country). When that other station shut down, he started his own and named it KACS-FM. Al later went on to work the all night shift at KSTP-AM (air name: Big Al Davis) when he got out of high school and also was later hired to work at WYOO. Al had great talent for his age. He currently operates his own business, Entertainment Plus. 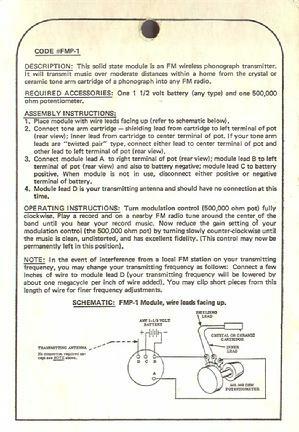 KACS was transmitted through a Radio Shack Wireless FM Mic, which Radio Shack sold as a P-Box Kit you had to assemble. With a little extra voltage and an antenna on the roof of a two-story house, KACS could get out a couple of miles. It was operated out of the basement of his home about one block from the old Edina High School (now a community center). Al use a home made control board to mix two turntables and some tape machines. The studio was in a closet in his basement off the laundry room. The station played top forty and has secured tapes of various commercials, such as Coke and Pepsi and has edited some demo jingles he was given by a local DJ at WDGY (I do not recall the name). This provided the sound of a commercial radio station. The DJ as KACS-FM were the best ones I heard in the group of pirate stations operating at the time in the Twin Cities. A couple of the DJ went on to professional positions as DJ's in commercial radio. Randy Randall was one of them and I worked with him for a time when we were both at KTCR-FM, a 50,000 watt country station in Minneapolis. Clip Number 1 from April 1970 is classic "Big Al" Arneson. Big Al is celebrating a Music Explosion Weekend. Al sounds good on this clip and you can see that he would eventually work in commercial radio. Speaking of commercials, you will hear the full length Pepsi Generation commercial with the phrase "You got a lot to live." Al also informs us you can pick up a copy of the KACS survey at all Woolworth's in Southdale Mall. Of course there is only one Woolworth's in Southdale (and probably none today). KACS actually had printed surveys with photos of the Jocks at the bottom. Other commercials include: Dairy Queen "Eat drink and be merry" featuring the new "Braizer Burger" and Al Arneson's self produced Eddie Holman's Album commercial. On the clip (Clip Number 2) from 1973 you will notice some 60 cycle hum. You will hear a heavy voice announcing you are listening to Al Arneson that was made by a local radio announcer. You will also hear Al mention the blackout in New England when he plays the Bee Gee's "When The Lights Went Out in Massachusetts." Former High School Pirate FM station DJ, Al Arneson Photos. Photos from 2007 and the late-70's. Al Arneson Photo from 2007. Al Arneson in a late=70's photo contributed by Mike Cunningham. As previously mentioned, Al Arneson went on to work in commercial radio, including WYOO as Big Al Davis. He did the all night shift which can be heard at the Radio Tapes web site by clicking the following address: http://www.radiotapes.com/U100Radio.html Look for Big Al Davis on this page. Al sounds a little different than the clips from his pirate radio station days in an Edina basement. The tape from WNAM posted here (to the right) is from February/March 1974. Al Arneson is Big Al Kelly doing mornings at this commercial station in Wisconsin. Randy Randall was also a graduate of Brown Institute (now Brown College). This tape was recorded before he attended but sounds better than the average Brown grad. Randy Randall also worked with me at KTCR-FM, Minneapolis (a licensed 50,000 watt country station). He did the 12 AM to 6 AM shift after my shift while I was at KTCR-FM. Randy later went on to work at WWTC, KRSI and KJJO. Randy now operates a jewelry store in Rochester Minnesota with his wife. He was a good guy to work with. On Clip Number 2, Randy Randall has KACS Keep on Trucking. You will also hear the actual request line announced (number long ago disconnected). There is a brief moment of news delivered by Steve Watkins. Randy Randall has also been helpful in providing airchecks on verious radio stations elswere on this site as noted. Pirate radio's Randy Randall moved on to work in real radio and one of the several commercial stations he was at was 93X KLXK-FM when this recording was made. 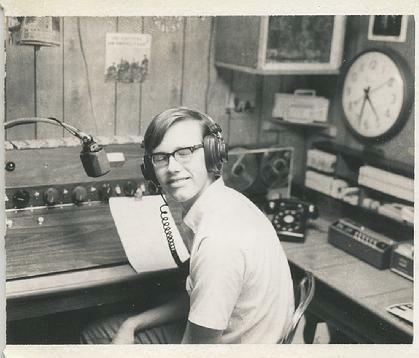 Randy went from Al Arneson's unlicensed FM station , to Brown Institute and later to KTCR-FM. He also worked at WWTC. This is a short clip that was submitted by Randy Randall on 9-26-06. It is undated but it was recorded approximately April 1992. You will hear Randy share his wealth of knowledge on classic rock artists he plays and you will here him promote the Riverfest Concert. Thanks to Randy for submitting this and other airchecks. 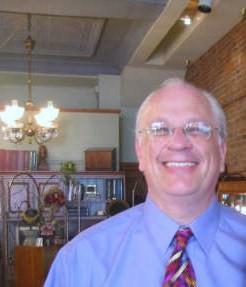 Randy Randall in September 2006 at his jewlery store in Rochester. Hight and Randall is located at 10 Historic 3rd Street SW in Downtown Rochester. 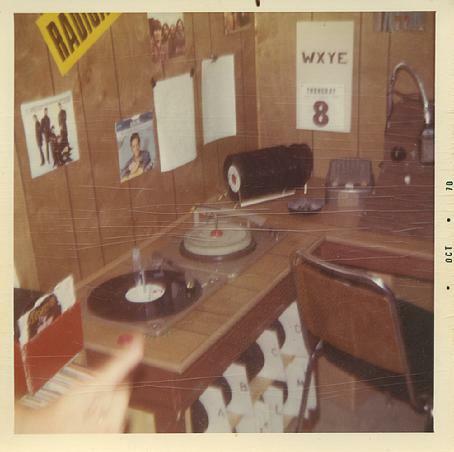 WXYE started as a pirate station broadcasting on Channel 11 on Citizen Band Radio using the call letters WXYZ (later modified to WXYE since WXYZ was used by a station in Detroit). That did not last long. A group of hobby CBer's shut us down after a few months. We then discovered the Radio Shack P-Box kits for hobbyist electronics geeks. The P-Box was a kit you built on a plastic perfab circuit board. It came with a crystal mic and used a 9 volt transistor battery with a short wire for an antenna. The transmitter was designed to get out 300 feet. It was basically an oscillator and the broadcast frequency was determined by a coil of wire (made by wrapping a 3 or 4 inch wire around a pencil). Expanding or contracting the coil would change the frequency. Not wanting to live with such limitations, one knowledgeable member of our gang, Paul Bunyan, was able to do some simple things to help get the signal out further than its designed 300 feet. First, the battery was replace with a 12 volt car battery we kept re-charging. This provided clean power with no 60 cycle hum. we added a police monitor antenna (designed for FM frequencies) and put it up as high as we could. We were broadcasting from a 1-story garage that had a 10 X 10 foot storage area converted into livable space. Paul then replaced the one transistor the P-Box contained with one that could take a higher voltage and added another 12 volt car battery in series (providing a total of 24 volts). WXYE-FM, from its location in St. Paul's West End (West 7th Street), was able to cover a part of the West 7th area, parts of Mendota (directly across the river), and all of Lillydale, a small area directly across the river (the town dno longer exists and was turned into a park due to sping flooding). At the time there were actually some people living Lillydale (now a park because of occasional flooding by the Mississippi River). In the studio, there were improvements made along the way as well. We started bare bones with a home-made funky control board and some cheap turntable with ceramic cartridges. The control board was later improved (twice), but was still homemade. The electronic broadcast quality was good. We could send a 19 kilohertz signal through the control board at 10% modulation and get the stereo light to work on radio receivers. WXYE-FM was not polished like the station above (KACS-FM Edina, MN). We did it for fun and for practice (definitely needed the practice). We intended to become real DJ's and a few of the guys went on to real radio jobs, but none of us are still working in radio today. We tried to get more professional after we discovered there were other pirate stations in Minneapolis, but we were a long way from the KACS standard. However, the lack of professionalism and structure make these airchecks interesting to hear. It was amazing some if us went on to work in commercial radio. WXYE-FM signed off for the last time in the spring of 1973. Pirate radio lives on today, although different. Most of it is conducted on the internet. You can get out a lot further on the web. WXYE-FM operated from 1968 into the early 1970's. Its final broadcast was in the Spring of 1973. During the Late 60's, the station was on the air every night after school and on during the afternoons and evenings on weekends. The station got out a few miles and due to its location on the West 7th Street bluff, completely covered Lillydale. That was when people actually lived down there. Even then, the population was only 100-200 people. On the upper end of the economic ladder, the station also reached into a portion of Mendota Heights, as well as a chunk of the West 7th Street area near Randolph Street. There were no political statements on WXYE-FM. No agenda. We were just trying to have some fun. As you will hear o the airchecks below, most of it was corny and unprofessional. Yet, a few of us did actually get a job in real commercial radio. 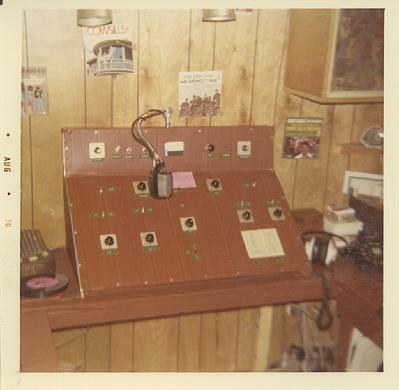 WXYE-FM 1st Control Board 1968. WXYE was then using the call letters of WXYZ. The call letters were changed later to WXYE beause there was no station with those call letters at the time. WXYE-FM 2nd Control Board. This board was ugly, but not as ugly as the 1st one, and it was a true mixer that was home build with a little assistance from a real 1st Call Radio Telephone engineer. This board used house light switches to start the turntables on the lower right side of the board. WXYE-FM 3rd Control Board. This was the least ugly one and it included enchancements in quality. This board had push button starts for the turntables. You will note there are two VU meters. Although the transmitter was not stereo, we could get the stereo recievers stereo indicator lite to light up by sending a 19 KHZ signal through the board at 10% modulation. 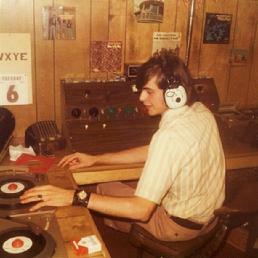 This is a photo of the studio of WXYE-FM 106.1 ("The Big 106") in St. Paul Minnesota taken around 1970. At the control board is Rick R Rockwood (later to be known as Rick Mason on KTCR-FM after some improvement). He looks like he has not had enough coffee in this shot. The control board was home made by Paul Bunyan (see below). He possessed a 1st Class Radio Telephone License and got it the hard way (he knew the stuff and did not just memorize answers like I did). There is a phone in the background and it was used as the request line. Yes, there were callers. I remember the number; "226-9419 is the request line." It was difficult for me to put this aircheck of Rick R. Rockwood a/k/a Rick Burnett a/k/a Rick Mason on this site. I was still in school at the time and my style was not natural. This tape starts at the broadcast sign on for the day. We typically signed WXYE-FM 106.1 on at 4 PM each school day and ran the station until 10 PM, sometimes later. This tape was recorded on December 30th, 1971. The best thing on the tape is the beginning station ID/DJ ID, with the voice of B J Clark of KDAN in So. St. Paul at the time. You will hear me struggle through a Twin City Federal commercial (I did not do well reading live copy). There are many promos of the Dave McCracken New Year's Eve show that will count down the top 106 hits of 1971. Unfortunately, the promo is over played until one gets sick of hearing it. The were a couple of versions, but it is still played too much. In preparation of the Top 106 Hits of 1971, we were playing 1971 gold every other song. WXYE-FM had a request line and had the ability to put people who called in on the air. WXYE-FM also use the Music Power Jingles from KYA in San Francisco with the KYA call letters edited out. As I listen to this again after many years, it sounds like bad announcing, bad DJ patter, and really bad attempts at humor. Paul J. Bunyan (a/k/a Paul Yancheck) starts his show at 6 PM. He sounded more natural and easier to listen to than Rick R. Rockwood. I always thought Paul would go on to be a successful radio DJ in a mid-larger market. He went on to a small market as a Chief Engineer in a Northern Minnesota station with a DJ air shift and later left broadcasting. He had better potential than a small market station, and I I was disappointed he never pursued a career in broadcasting. I thought he would have done well. Unfortunately for Paul and the rest of us, Rick R. Rockwood joins Paul at about 30 minutes into his shift. Again there is bad humor and segues that are difficult to listen to on the rest of the aircheck. For old commercials, you will hear an old Milk commercial. Rather than "Got Milk," you will hear "There's a New You Comming Everyday, Everyday." There is also a Coke "Its The Real Thing" commercial. Paul still lives in St. Paul and is working in mortgage brokerage. Rick eventually was hired by KTCR-FM out of Brown Institute for a part-time evening position. He later worked as the morning man on WWOD-AM, a country station in Lynchburg Virginia. He returned for a full-time position at KTCR-FM, doings evenings in the early to late 1970's. Paul J. Bunyan and Dave McKrackin in February 1973. The two recording were taped close together, one on Saturday night and one on Sunday morning. You will hear real corny humor on these tapes. The Saturday night tape has callers on the request line (yes there were really people listening) phoning in request and telling their own corny jokes. What sounds like a young boy on the request line (possible a girl), asks Paul what he look like, because he sounds cute. One of the jingles promotes "The all new sounds of the 70's." When played, it was followed by songs of the 60's. 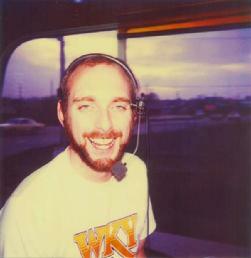 Dave McKrackin, when on to his first job in real radio as Dave Kay (without the jokes) at WWOD-AM in Lynchburg, Virginia. This was a Top 40 Country station in a town of 50,000 people in central Virginia. This is also a station where I, (Rick Burnett, on the air as Rick Mason) also worked for about 6 months before I went back to KTCR-FM in Minneapolis. This has a recorded off the air segments. On the last recording, WXYE-FM signs off for the last time. The WXYE-FM two man shows typically had many adlib, corny jokes in excess. There a couple of portions that are bad and it contains some gaps. This is a long clip, lasting over 1 hour 23 minutes. As a result the bit rate is at 80. WXYE-FM 106 - St. Paul MN. Pirate - Mike Matson December 1970 Mike Matson attended Brown Institute and later worked for a commercial radio station in River Falls Wisconsin. In addition to radio broadcast, he was an avid sports fan of the Vikings and the Twins. One of his first jobs as a teenager was as a vendor selling sodas in the stands at Twins games. I also tried that and lasted one game. Mike is also not working in radio anymore and lives in So. St. Paul with his wife. The photo to the right is of Mike Matson (Pittelkow) taken at St. Paul's Monroe High School in the late 60's. His airchecks are located above. WXYZ Prior to changing the call letteers to WXYE. Paul J Bunyan at the studi control board. This was the first control board. For larger (and additional) photos go to the WXYE reunion link below. Once there, the radio station phots start on page 3. In May 2006 I went back to St. Paul for a reunion of friends, (a few Pirate FM DJ's from the late 60's & 70's), and took some current photos of the gang. I also posted some photos of WDGY and KDWB along with some old photos of the Pirate FM station, WXYE in St. Paul. The Pirate FM photos show a progression of control board shots that improved as we learned to use better technology. Click here to see the WXYE Reunion photos. 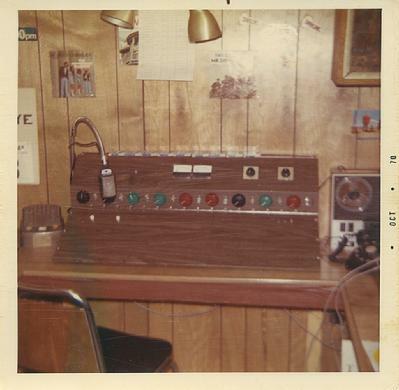 "I'd first moved my FM basement station from home to my room at Frontier Hall in the Fall of 1969. It was great fun, but not from an academic standpoint, so the setup stayed at home the following school year. I joined WMMR in the Summer of 1971, and Chi Phi fraternity at the beginning of Fall Quarter. Over the winter, I moved my record collection and station to the frat, and it became KIFI, pronounced just like the name of the fraternity. 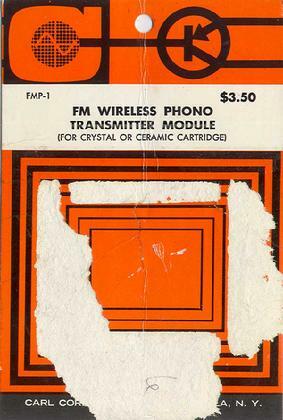 The transmitter was a $3.50 Cordover model FMP-1 FM phono transmitter module, about three-quarters of an inch thick, and no bigger around than a quarter. It was installed up in the attic, connected to a section of walkie-talkie antenna mounted with clothespins (!) in a flower pot (!!) on a specially-constructed shelf. The flower pot arrangement later gave way to a more stable cigar box mounting. KIFI obviously spared nothing for its state-of-the-art engineering! The frequency was determined by a combination of the length of the antenna and the precise placement of a penny underneath the bottom of the module. It was not a crystal controlled device (as if anything selling for $3.50 would have been!) so anyone walking within a few feet of the antenna would cause the frequency to change (one more reason it was located in the attic.) The frequency remained stable over the winter, but when the attic would warm up in the springtime sun, the frequency would change with the temperature, hence KIFI's '105.9 or thereabouts' slogan. One disadvantage of the attic antenna location was that nearby KEEY-FM was always audible underneath KIFI's audio. Wires were strung out from a roof vent, leading down to my room for the audio and power. A DC power supply was used to keep the station on the air around the clock. While KIFI's signal was strongest from its location on <?xml:namespace prefix = st1 ns = "urn:schemas-microsoft-com:office:smarttags" />19th Avenue SE (across from Williams Arena) to Dinkytown, requests came from as far away as Alpha Phi sorority, near 10th and University. As much as my budget would allow, I did my best to replicate what was being played on WMMR. The folks at the Muiscland store on 7th Street in downtown Minneapolis would have a stack of special order blanks waiting for me on the counter upon seeing me walk through the door. It was surprisingly difficult to buy many of the 45s that WMMR played. While even the most obscure current singles could be obtained on the biggest labels like Columbia, Capitol and Decca/MCA, those on most other labels could not, and those special orders would be returned as 'not available.' I was able to obtain service from A & M through WMMR's Mike Wild, who was also A & M's campus rep for the area. We also received recorded programs from the US government. A couple of my fraternity brothers took it upon themselves to build record shelving and the control board for KIFI. We used two turntables, two cassette decks and one of the microphones from my Ampex cassette recorder, using a Panasonic reel-to-reel deck as the mic preamp. My Radio Shack STA-120 receiver (which still works!) was used to simulcast KRSI-FM whenever KIFI wasn't originating its own programming. While the majority of KIFI's in-house programming came from its radio-obsessed owner, several of my fraternity brothers and a few WMMR staffers took turns as well. I hadn't thought about its impact until one of my fraternity brothers told me that KIFI had given our fellow brothers a chance to be 'on the radio' that they never would have otherwise had. THAT is what pirate radio was really all about. None of us ever used our real names, so KIFI was blessed (?) with such stars (??) as Gary Grooveout, Jolly Roger, Jack Daniels, Cush, and so on. In the Spring of 1973, I got a call from Gary Jacobson, a reporter for the Minnesota Daily student newspaper. He wanted to do a story on KIFI, so we set up a time for him to visit. At the time, we had a roomer at Chi Phi who also worked at the Daily, so I had assumed that he had told Gary about the station. During the course of Gary's visit, I asked him how he had heard about KIFI, and his answer left me speechless. He indicated that there was a group of blind students over on the West Bank who would take their radios and ride on the bus on weekends, trying to see how far away they could pick up KIFI's signal! KIFI remained on the air until the end of the summer of 1974, when I moved out of the fraternity, and into an apartment near Ralph & Jerry's Market on SE 4th Street. The new location was not well-suited for broadcasting, and with classes, a job and having become WMMR's Music Director vying for my time, KIFI went off the air for good. 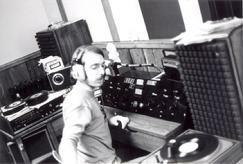 By 1978, I was working at WJON in St. Cloud. While chewing the fat with WWJO PD Dean Spratt one day, the subject turned to pirate radio. I mentioned KIFI and the bus-riding DXers on the bus. Dean said, "That was YOU?!" Dean had been one of those bus-riding KIFI listeners. Small World!" "During its top-40 heyday, KOMA was legendary in the western <?xml:namespace prefix = st1 ns = "urn:schemas-microsoft-com:office:smarttags" />U.S., but Gaylord rival WKY/930 dominated in Oklahoma City proper. Whereas Storz was very tight with the bucks, Gaylord gave WKY the tools to win, and then some. I left KOMA soon after Storz sold the station, and moving across town to WKY was a real eye opener. Gaylord had owned WKY since 1929, and by 1984, also owned the Grand Ole Opry, Opryland, WSM-AM & FM, and the Oklahoma City newspapers. Because it had controlled such a huge chunk of the market's advertising revenue, the company had been forced by the FCC to divest of WKY-TV/Channel 4 in the '70s. Gaylord then built spacious new studios next door for WKY. Each jock had his own office in the building, there was a jock lounge with recliner, a huge, but rarely used recording studio with grand piano, cart dubbing facilities in the music director's office, and the largest radio news staff in town. WKY's 5,000-watt signal was fed into a Franklin antenna, yielding the equivalent of a roughly 13,000-watt signal that, when combined with the area's excellent ground conductivity, easily blanketed central Oklahoma day and night. 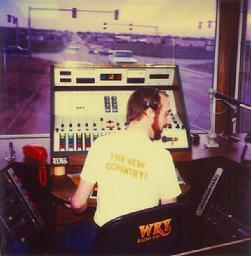 WKY also had a huge mobile studio that ran off of its own generator, used primarily for broadcasting from the Oklahoma State Fair. 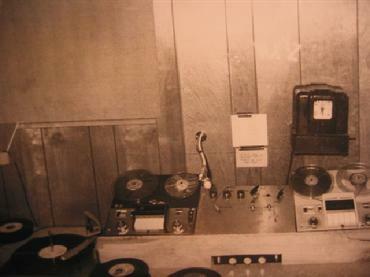 The unit was fully-equipped, with six cart machines, reel-to-reel decks, mobile phone and the works. The mobile studio was housed in an enormous garage at the station. The only thing that WKY lacked by 1984 was an audience. Barred from owning an FM signal in town because of the newspaper, WKY had soldiered on by switching to an AC format that by the early '80s sounded dead on the vine. In the summer of 1984, Gaylord had decided to switch WKY to country, and did so under Gregg Lindahl, former KOMA PD and then-current WSM AM-FM PD. I came on board to do afternoon drive. Someone came up with the idea of putting WKY's mobile unit (repainted and dubbed 'Cimarron Sam') to better use in order to build awareness for the station's new format. Why not do something completely different: a rolling remote? It would be quite expensive to operate the mobile studio while in motion, but Gaylord was definitely up to the task. A test run was done within a few miles of the station, and the Marti unit and everything else worked great. It was time to turn some heads. I had the honor of hitting the road for the inaugural remote. We contacted the KTVY/Channel 4 news folks next door, and they sent crews out to follow us from both inside and outside. Jay Perkey, WKY's chief engineer, drove the unit, and off we went. Man, what a trip! It wasn't an ideal setup because the studio had been designed for standup use, so I had to stand in order to see over the board. That was easier said than done while moving in stop and go traffic! A rope was tied in place to keep the chair from rolling from one end of the room to the other. Crossing railroad tracks was pretty interesting. The generator managed to keep the cart machines up to speed, which was a good thing because I WAS playing the music on the road, too. As you might expect, the reactions from drivers were worth every penny. After all, when was the last time you've driven home while both listening to AND watching your radio station? The story was featured prominently on Channel 4's news that night. We did a second run on the road during my show before Cimarron Sam was relegated back to its more typical minimal use. I do have the Channel 4 story somewhere on video, but I don't have a WKY aircheck of either show. I never heard whether or not the rollin' remote was attempted again, as I left WKY after only seven months for greener pastures back home at WDGY. Although the new country format couldn't compete over the long haul against multiple FM country signals in town, WKY's legacy continues today. What were once the WKY studios are now home to Renda's Oklahoma City cluster, which includes top-rated heritage oldies KOMA-FM, the on-air home of several of the very same jocks who had propelled WKY to the top back in the late '50s and '60s. WKY mobile unit: From A WKY promotional "Introducing 'The Sales Maker'" postcard; year and jock unknown. I don't recall whether or not the moving signs were folded down for the rollin' remote... probably down. The Marti antenna mast was extended just high enough to safely make it under the overhead obstructions on the carefully-planned route. 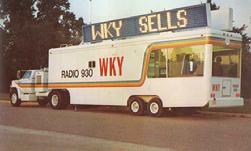 By 1984, the mobile unit had been repainted in a yellow-gold with the sleeker WKY logo seen in the other photos. WKY Rollin' Remote (1) : "On The Road Again," anyone? The cart machines are off to the left, and reel-to-reels are on the right. Note the rope in the lower right corner to keep me from rollin', rollin', rollin'. The board with the overly-large profile was made by Dyma in Taos, New Mexico, as was the control room board back at the station. The control room board had an unusual configuration that allowed you to hear the monitors with the mic hot, without any feedback. If you could get used to that, you didn't need to wear headphones while on the air. WKY Rollin' Remote (2) : Ask me if I was having fun!" Richard Nelson does the news on this clip of KXUL. In addition, J. J. Barnes is the DJ doing the record show, Encore 66. This is the first aircheck of KXUL that I have come across. I think this is rare and I have not seen any others yet. You will also hear Richard as a DJ on his pirate station in Sount Minneapolis. He broadcasted on 1550 AM and called KFMC "Minnesotas Last Radio Station."